It's the thirties in Abbott , Texas , and Bobbie Nelson and young brother Shotgun Willie are first exposed to the wondrous world of family music - their family. There's cotton and guitar picking, hay baling, church worship, gospel singing and piano playing. And, of course, there's the music on post-World War 1 wireless - the family's window to the world beyond the tiny town (population 356) with its own water tower but TV a long way off in the future. The octogenarian siblings Bobbie, now 84, and Willie, 82 on April 30, reflect the times on their new duet CD - Willie's 70 th new studio album. And on their mini-docco video and several new video clips that we feature on Nu Country TV on Channel 31, Digital 44, for the first time. “We grew up working on farms and making our school money picking cotton, baling hay, whatever. It was a great way to grow up,” Willie revealed of life in the farming font north of Waco in central Texas. The pair share the screen with shots of fields and churches, as well as old photos from their upbringing. “Some of my, really, earliest memories, besides walking through the field, would be us learning music, our grandparents showing us music,” Bobbie Nelson recalled. “Don't be concerned 'cause it's time I learned/ that those who play with fire get burned/ but I'll be alright in a little while/ but you'll be permanently lonely.” - Permanently Lonely - Willie Nelson. The siblings have been playing together since they were kids, starting with performances at church revival meetings. Their video is full of humour and tenderness that translates into good chemistry on stages - especially on their Australian tours dating back to 1981. “There's nothing like playing music with Willie. 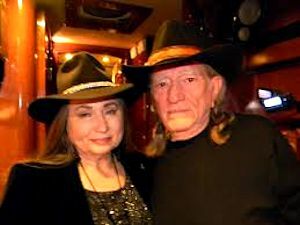 I get an energy from just sitting with me at the piano, but when I sit with Willie, it's just an all-new energy,” Bobbie says of sharing the stage with her brother. Willie expands on that theme. “We play together, I think, as well as anybody,” Willie explained. As brother and sister growing up in Abbott, Willie and Bobbie learned to read music and play instruments as pre-teens under the tutelage of their grandparents, who raised them. They played together in Texas bands early in their careers and Bobbie has been an essential member of Willie's Family Band since its official formation in 1973. 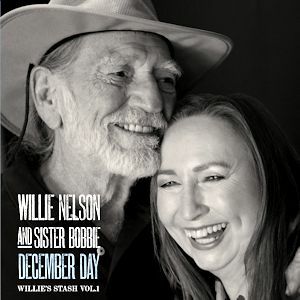 Willie and Bobbie's deeply intuitive musical bond, formed and developed through decades of practice and spontaneity, laces the fruit on the December Day tree. "A past that's sprinkled with the blues / a few old dreams that I can't use/ who'll buy my memories of things that used to be/ there were the smiles before the tears and with the smiles some better years/ who'll buy my memories of things that used to be/ when I remember how things were my memories all leave with her/ I'd like to start my life anew but memories just make me blue/ a cottage small just built for two a garden wall with violets blue/ who'll buy my memories of things that used to be.” - Who'll Buy My Memories? - Willie Nelson. Well, the duo kick off with Irving Berlin classics Alexander's Ragtime Band and What'll I Do punctuated by Willie 1963 original Permanently Lonely . The album is augmented by other Family Band members, including harmonica player Mickey Raphael and late bassist Bee Spears on What'll I Do, recorded during Bee's poignant last session with Willie. 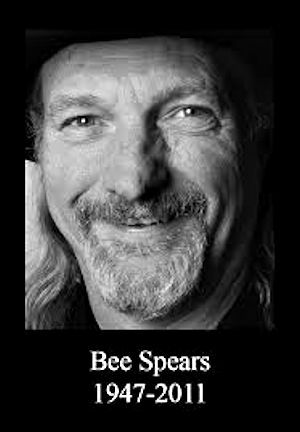 Ironically San Antonio born Bee, who had played with Willie for 40 years, died at 62 in 2011 in a fall outside his mobile home near Nashville - on a December day. Then it's another original couplet Summer of Roses and December Day , dating back to 1971 and 1968, and accompanied by new video. The duo also honour Willie's guitar guru Django Reinhardt with his 1940 tune Nuages and historic oft covered hit Mona Lisa. Salient sequencing gives us two new Willie originals I Don't Know Where I Am Today and not so cryptic Amnesia . The album is a mix of re-recorded greatest hits, deep cuts, covers and new originals. The 18 song project was borne from a string of casual jam sessions aboard the country legend's tour bus, the biodiesel-fueled Honeysuckle Rose . It was there that Willie and Bobbie - armed with trusty guitar Trigger, a travel-size keyboard and a musical chemistry that dates back to the siblings' childhood days in Abbott - have a long history of regrouping after shows to play their favorite songs. But it's the plaintive 1972 narrative Who'll Buy My Memories that resonates with good reason. When federal agents raided Willie's Texas home on November 9, 1990, they weren't looking for drugs. Instead, the feds seized most of Nelson's worldly possessions - including his recording studio, instruments, memorabilia and more than 20 properties in four different states - to help pay off the whopping $16.7 million he'd racked up in back taxes and penalties. In a touching display of support many Nelson's fans purchased those belongings and then donated them back to Willie. The only thing the IRS didn't get was Trigger - Nelson's favorite guitar that had been spirited away from the home several days earlier by his daughter, Lana. Nelson wound up using Trigger - and little else - to record next album, The IRS Tapes: Who'll Buy My Memories ? The acoustic collection of new songs and standards was released in 1992 and the profits went straight to the IRS and helped Nelson finally dig himself out of debt. More than two decades later he's still playing Trigger - a Martin N-20 classical guitar that's as weathered and mellow-sounding as its owner - as well as Who'll Buy My Memories ? It reappears on December Day released on December 5, 2014. Willie sings wistfully, punctuating lines with jazzy, out-of-time runs on Trigger's beat-up fretboard. Bobbie accompanies him on grand piano, and the pair's performance is intercut in the video with grainy footage of their hometown, including churches, crops, the Abbott water tower and endless expanses of blue Texas sky. Today, with Willie nearing 82, the song is a poignant reminder that everyone - even one of the country music's most enduring icons - is mortal. “I'm writing a song all about you/ a true song as real as my tears/ but you've no need to fear it 'cause no one will hear it/ 'Cause sad songs and waltzes aren't selling this year.” - Sad Songs And Waltzes - Willie Nelson. Al Jolson classic The Anniversary Song is followed by another new Willie original Laws Of Nature, 1974 tune Walkin' and Berlin 's Always . The singer reaches back to 1964 for his originals My Own Peculiar Way and Sad Songs And Waltzes , 1966 for I Let My Mind Wander and 1978 for Is The Better Part Over? The fitting finale is the nuptials of Willie's 1964 original I Never Cared For You and 1943 vintage Ou-es tu mon amour by Emile Sterne and Henri Lemarchand. In his first-hand observer liner notes Mickey Raphael provides fascinating details of album performances and insights into the artists' creative process. "As long as I can remember, Willie and Bobbie, who ride together on Willie's bus, spend some of their travelling time jamming on their favourite songs,” Raphael writes. "Bobbie has a travel size keyboard on the bus and Willie's guitar, Trigger is always by his side. This is where the idea for December Day was born. ‘Why not record our favourite songs like we play them for ourselves?' Bobbie asked”. 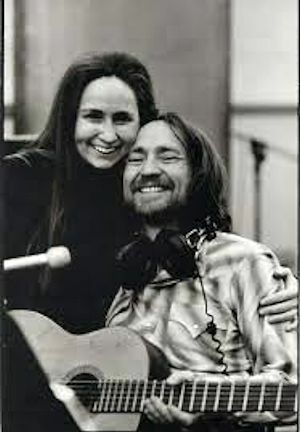 Mickey wrote "When it comes to a brother-sister collaboration with the longevity of Willie and Bobbie, there is beauty in keeping things simple. Less is more is the underlying theme. We've heard these songs before but not like this. The spontaneity born out of familiarity is what this record, December Day is all about. It's not rocket science, it's alchemy." Nelson is focused less on sticking it to the taxman and more on highlighting the things that never really die: family bonds, memories and the music that glues them all together. “Is the better part over?/ has a ragin' river turned into a stream?/ is the better part over?/ are we down to not quite sayin' what we mean?/ and after thinkin' it over/ wouldn't you rather have the endin' nice and clean/ where love remains in all the closing scenes?' If the better part's over.” - Is The Better Part Over - Willie Nelson. The Willie's Stash series presents a variety of releases, personally curated by Willie, culled from decades of recording and touring in a career that long ago established the four times wed singing actor as an American musical icon. December Day is Willie's fifth release since signing to Sony Music/Legacy Recordings in 2012. His previous Legacy disc Band Of Brothers , was released in June 2014 and hit No. 1 on Billboard's Country Albums chart. December Day is produced by Buddy Cannon and recorded by Steve Chadie at Willie's Pedernales Recordings Studio in Austin . Musicians include Willie (Trigger), Bobbie (piano, B-3 organ), Raphael (harmonica), Kevin Smith (bass), Spears (bass), Billy English (drums, percussion) and David Zettner (acoustic guitar). Meanwhile Willie's sons Lukas and Micah appear on Willie's Farm Aid partner Neil Young's new album The Monsanto Years. “I'm working on another album now. I'm doing with Willie Nelson‘s sons,” Young revealed recently. It's not the first time the Canadian born star has worked with Lukas and Micah. They joined him at Farm Aid, Harvest the Hope Concert and the Bridge School Benefit . Lukas and Micah inherited their dad's love of music. Lukas heads Lukas Nelson & Promise of the Real and Micah is part of Insects vs. Robots. “We grew up surrounded by music so there's environmental factor too,” Lukas Nelson explained.